This is how I install package bees. This year there will be a change. All the 2 lb packages will be in a plastic cage(video coming soon). The 3 lb packages will still be in the wooden package bee cage. First delivery, 2 lb packages Monday April 11th. Second delivery 3 lb packages Monday April 18th. There will be a pick up schedule posted. The schedule goes by the first initial of your last name. You will be given an hour block of time to pick up. We have to spread beekeepers throughout the day, to assure a speedy hand out of bees. If everyone came at the same time, the wait for bees will be several hours. The pick up schedule system we use works well and most beekeepers are here less than five minutes. There is no hurry to put the bees in. The best time to put the bees in the hive is after 6:30 pm. Watch this blog for updates as the delivery can possible change due to weather in California. As the delivery date approaches check the blog daily for updates and to make sure the bees have arrived. Our store is closed on bee pick up day. You need to purchase your bee supplies before the bees come. We do sell ProSweet syrup, feeder pails, and pollen patties on bee pick up day. Smoked this colony right before the pollen patty went on. The bees were peeking from between the frames looking for a scrumptious pollen patty to eat. The hives are currently on spring build up. The queen is laying and new brood has been hatching out. Colonies have been eating pollen patties, being that it has been too cool for bees to get out and forage for pollen. The cool weather has slowed pollen bearing trees from budding out. As our temperatures warm up, more pollen will be coming available. Pollen patties need to be on the hive for colonies to have a steady supply of pollen substitute. Without pollen the bees may not even have any brood going in the hive. Pollen patties are cheap insurance that a colony will continue to build up. Feeding syrup is on an as needed basis. If the bees need honey, feed syrup. Don't over feed. It would be a shame if a hive starved from lack of attention from the beekeepers. As the temperatures warm stronger colonies will be occupying more and more of a multi story colony. Usually around April first beekeepers usually do a reversal. The purpose of the reversal is to give the queen more room to lay. By spreading the brood throughout the colony will bring a larger population to a properly managed colony. Keep the pollen patties on and hope for warmer weather. My friend Brian has some 4 frame nuc's available. The nuc's come from Texas. The are delivered in early May. 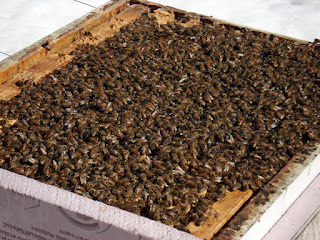 The nuc's will come in a cardboard nuc box, four frames of bees and a mated MN-Hygienic Queen. Limited number available call NOW if you want some. This is a link to the bee informed blog. This article by Meghan Milbrath from Michigan State University extension. Is an in depth look at symptoms of hives that have died over the winter in northern climates. Once again Varroa is the culprit in many cases of hive mortality. 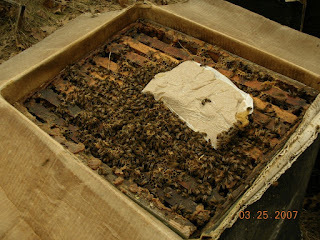 Two beekeepers called me yesterday to tell me they have no brood and must be queenless. They both said they had pollen patties on. After a brief conversation both told me they had the patties in a place where the bees cannot easily get at the patties, and the bees were not eating the patty. Pollen patties need to be placed right on the cluster of bees. If the bees can't mass around part of the patty, they won't eat it. If they don't have pollen, the population of the hive will suffer. If you want an email on delivery dates, please sign up for my newsletter. Olivarez Honey bees are starting to make queens for the package bee season. These are queen cells waiting to go into mating nucs. Each peanut shaped queen cell will be placed in a mating nuc with about a cup of bees. The queen will emerge from the cell. After a week she will be able to fly and go out and get mated. If the weather is good for mating, she will mate with many drones. MN cold is coming back in a week with high's around 40. Beekeepers should look at the long term forecast before doing reversals. Winter covers that have been removed could be put back on in a week if a beekeepers wants to. The Univ. of MN Bee Lab has added another Keeping Bees in Northern Climates Year 1 bee class. It is on Saturday March 26th. It is filling up fast. Sign up right away if you are interested. What is up with this weather. I have been hesitating writing about the current late winter weather. I wasn't sure what to make of it. But now the long term forecast looks like this weather may be here to stay. I am looking at this two ways one side says go for spring time management or the other, hold off because it is still winter. I think it is safe to take off the winter covers and moisture boards. If it gets cold again the covers are easy to put back on if a person wanted to. The moisture boards can be put away they will no longer be needed. Normally reversals happen around April 1st. If your colony is jammed packed with bees a reversal can be done. If your top box is not packed with bees then I would hold off on reversals for a while. Pollen patties should be on now. The pollen patties need to be placed where the bees can touch the patties. If the patties are put too far from the bees, the bees will not consume them and the brood in the hive may not be getting what they need to build up. Speaking of pollen, we should start having natural pollen available soon. Pollen patties still need to be on. If the weather turns cold the bees can't forage. If there is no pollen in the hive the brood can perish and set a colony back. Bees will be looking everywhere for pollen. The bees will be at bird feeders and sawdust piles picking up dust. It is not pollen but they think it is. Sawing up green treated lumber this time of year? Bees will collect the dust and bring it back to the hive. Treated lumber sawdust is toxic to the bees and can kill a hive. This colony if it has bees top to bottom like this, could be reversed. Look under the box to see if the bees are covering all the frames. If they are, it could be reversed. If not hold off. A reversal is in this order. three deep and two deep, box number order. Before and after the reversal. When in doubt, do nothing. The most important thing right now is pollen patties and enough food to stay alive. Don't feed pail after pail of syrup. You will plug the hive up with syrup leaving the queen no place to lay. The weather will dictate the reversals in the near future. There still may be 40's in the future and getting too far ahead, may be like shooting ourselves in the foot. Queens aren't available until late April. The bees won't be swarming until late April at the earliest. Patience and observation is where we are at on the bee front. Look at my links section on the right hand side of this blog. How to divide a colony. That is from Gary's webpage. Gary does a great job of describing the pre- divide work and the divide itself . We are still taking orders for package bees. Our first delivery of all two lb. packages still has a little room left. The second delivery of 3 lb. packages is a little almost 2/3rds full at the moment. This photo was taken in the Hugo area on Sunday. 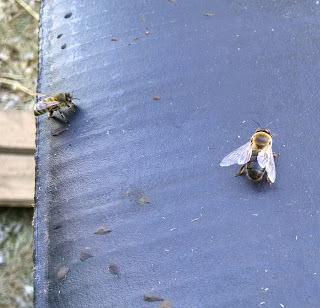 The bee on the right is a drone. Normally drones aren't produced much this early in the new bee season. To produce drones in large numbers, there has to be good amounts of natural pollen is coming in.